The thought of riding a train in Mexico started crossing my mind. What would it be like? How would it compare to riding trains in the states? Would I be riding with pigs and chickens? Could I travel without speaking Spanish? How safe would it be? What would the bathrooms be like? Would the cars be filled with anything other than dust? There was only one way to find out so I booked a trip with the Pacific Southwest Railroad Museum for my parents and myself on a "One Day Train Trip in Mexico." We drove down to El Centro on a Friday night and stayed in a motel in order to be close to Mexicali for Saturday's trip. After a restful night sleep, we drove the ten miles to Calexico and parked on the street near the US/Mexico border. We walked across the border into Mexico, my first time in this country and were surprised that there were no Mexican officials waiting for us to enter their country. We had filled out our tourist permits in advance, but I guessed that they would take those on the train. We joined the group of Americans south of the border to board the train. At 7:30 AM down the meridian of the main drag of Mexicali, the train was pulled backwards right up to the border gate and we boarded. It took about fifteen minutes to load all of the passengers. There were ten cars on this train, eight Mexican railroad coaches, two which had open windows and the other six built from Japanese kits with six large air conditioning units on their roofs. They all came from the car stock of the Sonora Baja and California (SBC) and the Pacifico (FCP). The first of these cars were for the local people going one way to Puerto Penasco. 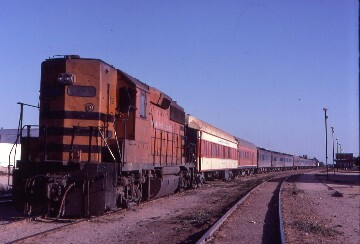 On the rear of the train are the privately owned sleeper (Mexicali Rose) and lounge car (Maria Elena). The train was filled to capacity except for the local Mexican coach. At 8:00 AM we left the border to start my first train trip in Mexico. We passed through the old section of Mexicali with all of the stores and signs in Spanish. I saw my first Alto sign and commented,"That looks a lot like a stop sign to me!" Loud music came from the stores playing various Latin music pieces. On the right we passed a large cemetery, then the Bull Fighting Stadium before going by the Capitol Building of Baja California Norte and swinging off the main drag into the Mexicali Railroad Station. At the station stop, Mexican Custom's Officials boarded the train to take our tourist permits. Any trip into Mexico past a certain distance from the border requires any out of country visitor to fill out a tourist permit. It was explained to me that this way the Mexican Government always knows where the tourists are in their country. I find these permits to be very funny, crossing out pictures to represent what you are and a picture of a steam locomotive to represent a train that I am taking. The agents did their jobs quickly and we were on the move again with only a ten minute delay. The train moved through the SBC yards before heading out of town along the main drag. Trash was spread all over the ground and the houses had become shacks. Children ran out from their homes to wave at our passing train. The train returned the greeting by leaving them in a cloud of dust. The train passed through an area of fields which gets the water from what is left of the Colorado River when it reaches Mexico. Geothermal wells are located out in these fields producing a great deal of electricity for Mexicali, Tecate and Tijuana. I got up to explore the train, heading to the front end first. I walked through the six coaches of Americans finding no surprises, but when I entered the Mexican rider coach, welcome to the third world! Children running out of control wearing only diapers, men drinking tequila straight out of the bottle while playing cards, a man with a heap of manure in the middle of the aisle (where's the cow?) and a woman breast feeding her baby right out in the open. I walked out the door behind the engine for some fresh air. In order to return to my part of the train, I had to hold my breath, then hop, skip and jump through the rider coach and back to the reality of our excursion coaches. I walked back through each of the coaches reaching the sleeper and finally the lounge to watch the kilometers disappear. The railroad ties were concrete and these are the first ones I have ever seen. I walked forward and found an open vestibule window on the right side of the train. The train slowed and then shared the toll bridge over the Colorado River with the highway and entered Sonora. The highway toll goes to the railroad for the autos use of the bridge. The river very mighty in the United States is just a trickle by the time it reaches this point. We curved off the bridge and came to a stop short of the siding in the town of Coahuila. The brakeman dropped off and threw the switch lining us into a siding blocked by box cars. He shuts the switch then took a cigarette break. Five minutes later, a distant headlight appeared. 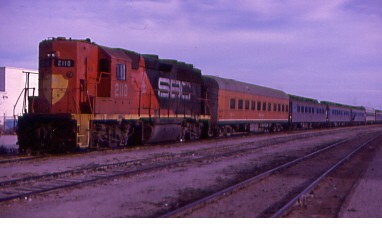 SBC train 2, one of the two daily passenger trains which originates in Guadalajara and travels over both the FCP and SBC to reach Mexicali. He slowed to pass us before leaving us in his dust cloud. The brakeman then relined the switch, we backed out of the siding and he switched the switch for the fourth time before we headed off towards Puerto Penasco once more. Leaving the farmlands behind, we headed out into the Altar Desert, a sea of sand and low lying bushes with a distant mountain range to the north. The only thing out here besides the railroad is a lone telegraph wire that parallel the tracks. There are no roads to be found, just the vastness of the empty desert. Temperatures here can reach the 130 F temperture mark and rainfall is a rare occurrence. Every so often there is a passing siding and a set of maintenance of way workers houses with a few trees. The area between these sidings are thirty kilometers, in between nothing but the barren desert which is getting sandier and sandier. All this sand was making me thirsty so I went and bought my first Tecate Beer. Suddenly on the left hand side of the train we passed a monument called The Crosses built in the middle of the sand dunes to the memories of four railroad workers who lost their lives in a sandstorm while they were surveying the railroad's route. The next four sidings were named for them: Sanchez Islas, Torres B., Lopez Collada and Gustavo Sotelo. Off to the right I could see the clear blue waters of the Gulf of California. We cut inland and a few buildings appeared. They became greater in number as we entered the outskirts of Puerto Penasco. The train slowed and entered a yard track, past the wye, pulled down near the station before coming to a stop. We had arrived at Puerto Penasco. During our layover, we visited a hotel which had a fiesta for the train passengers then took a bus around town to have a look Puerto Penasco. I finally left my parents to shop and found a hotel right on the point. I sat with my feet up against the seawall drinking Margaritas. The setting was perfect with the view of the Sea of Cortez and the waves gently breaking on the rocks below. With the afternoon almost gone I returned to the train and we departed towards the sunset. On the move again, I went to the bathroom and a thought came to my mind. There's only half a toilet seat and I remembered that this morning the other two bathrooms only had half a toilet seat in them as well. I wondered to myself what might cause this? I came up with only one conclusion, someone at home had broken their toilet seat and went to the train to get another half to make a whole. I liked that idea better than thinking there's someone out there that goes around breaking railroad toilet seats in half. At least I did not have to go number two! The train made it's return to Mexicali under the cover of darkness except for the first half hour when the train headed straight into the setting sun. At Sanchez Islas, we me an eastbound SBC freight train pulling twenty one cars with a single GP-35. After reentering Baja California Norte by crossing the Colorado River, we went into the siding for SBC Train 4 at Delta. We made a brief stop at the Mexicali Train Station before running up the main boulevard with the horn blaring warning everyone of our passage back to the border. We dashed to Customs, passed through them quickly and returned to the car to drive home to Santa Ana, with my first train trip to Mexico complete. This trip was done with my dear friend Jeff Hartmann on his first Mexican train ride. Since I had done this once before I acted like a tour guide. We both had a real good time and enjoyed our Mexican train riding experience together. My father joined me on this trip and it went off without a hitch. My highlight was asking to go up into the engine before they wyed it then was asked to stay while they performed the act. I had to climb off the engine to remove some scrap metal that was across the tracks and after I did that, our crew allowed me to throw all of the switches. I got to live out a railroad working man fantasy for about half an hour. The crew thanked me by giving me a Sonora Baja California Employee Timetable. The most memorable of the Puerto Penasco Trips occurred on April 4th, 1987 and Brad was making his first train trip in Mexico, but this trip will live on in our memories as being the most interesting Guntar (Guenzler/Tarr) adventures of all time. We drove to El Centro to the Motel 6 on a Friday afternoon and started partying (drinking) until late that evening. We got up the next morning, drove to Calexico, finished off the bottle from last night before getting another bottle of Kessler for this morning. We walked across the border and boarded the waiting train. The morning pased like the other three trips did and we arrived at Puerto Penasco two very happy people. I acted like a tour guide taking Brad to the fiesta, shops and to my hotel on the point where we drank two pitchers of Margaritas. We reboarded the bus and after a few minutes Brad gets up saying he's going to buy something for his wife and got off the bus. I yelled out of the window to be back at the train by 5:00 P.M. I went back to the train and went to photograph the head end and to talk with our train crew. After about forty five minutes the crew yelled all aboard, I climbed aboard and off we went. I searched the train high and low for Brad but he was no where on board. Brad Tarr was left in Puerto Penasco, Mexico with me heading west. With Brad having the car and hotel keys with him, I had to put together a plan to get me home. I talked to the trip's director Sylvia and told her my tale before asking her if she could help me get home. She could get me back to San Diego on the group's bus, so at least I would be back in the United States. I took her up on it and we arrived at the Amtrak Depot at 12:30 A.M. The San Joaquin Bus had left but a nice couple offered to take me to the Greyhound Depot and took them up on it. I walked into the depot with an ice box in one hand with a Mexican Blanket I bought draped over my shoulders. People were laughing at the sight of me as I asked what time is the next bus to Santa Ana and got told four thirty. I sat down, looking around the place and realized by the looks of these people I may not be alive at four thirty. I noticed a door with a hotel name on it and to use the street entrance. I opened the street door, looked both ways to make sure no one was coming then walked out into the night and into the lobby. The desk clerk gave me an odd look but I reached him with my American Express Card saying I needed a room and a five thirty wake up call. I filled out the registration card and thought at least I had a room for the rest of this night. I went up to their fifth floor overlooking the Greyhound buses and all their diesel fumes. I fell fast asleep. The wake up call came all too soon with a quick shower and checkout. I walked down Broadway towards Amtrak looking the same with the ice box/blanket as I had last night. I passed a bar where the drunken sailors who had lasted until last call were out in front. They started laughing, making jokes and rude comments. I knew if I looked I would be dead so I just kept walking. Arriving at Amtrak, I pulled out my American Express Card asking for a one way ticket to Santa Ana looking more like an illegal alien than the normal Chris Guenzler. As I boarded Amtrak Train 570 the conductor asked me what had happened and I told him I would tell him on the train. I was now safe and sound with all I could think about was where Brad was? I arrived at Santa Ana on time and walked down the train tracks to 21st Street before taking the long block walk home. I called Brad's wife Mitra to tell her what had happened and she said it sounds like Brad. Why does not that comfort me? Brad got off the bus not to buy a present but to get sick. When he got back to the station he found that the train had left without him. We went back to the bar, met three Mexicans guys who spoke no English, taught them their names in English and they in turn took him bar hopping. At the last bar of the night, he got put out on the streets at closing and basically fell into a Red Cross Hospital. The doctor said he could use a bed as long as no one else needed it. The next morning the doctor took him to the bus depot and got him a ticket back to Mexicali via Sonyaitta at the Arizona border. He crossed back into the United States and since he had the key to the motel room he decided to take a shower. The maid heard him, went and got the manager who charged him for another night at the Motel 6. He drove home via Julian and called saying he was alive and well in the United States thus ending this saga. A special thanks to the Pacific Southwest Railroad Museum for these great trips and for all their help on the last trip.